Earlier today someone passed me an interesting table on the expected times that each of the councils in Scotland expect to declare their results and the percentage of the electorate that they cover. As well as that there was an indication on how likely the people living in that area were to vote Yes. So this leads me to my second from last piece of analysis on the Scottish Independence referendum. I’ll look at the results compared to the predictions when the detail is available. It’s going to be an interesting night. Some of the areas with the most Yes support are expected to be in the first wave to declare their results. Early on (from about 2am) it will look very much like Scotland has voted for independence, perhaps by as much as 60/40. This shouldn’t be taken as a cue to celebrate if you are a Yes supporter, nor to go to bed early as a No supporter. We’re only likely to know the final answer when the last council in Scotland declares its result, sometime around 6am. 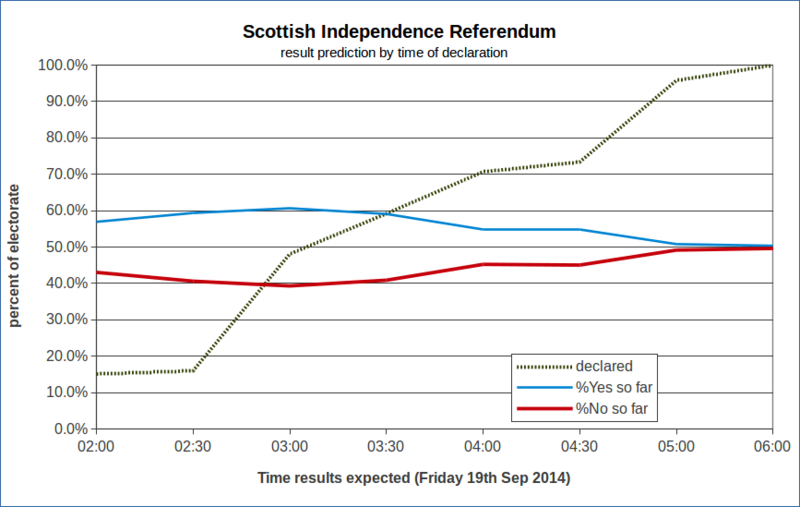 The graph shows the story, and it predicts a small marginal victory for Yes to Independence. 50.3% in favour to 49.7% against when all the votes have been counted and all the councils declared. Possibly your best strategy would have been to have had a sleep this evening and set the alarm for 4am when it should become truly exciting!